President Michael D Higgins today (Weds) officially opened a Homeless Accommodation facility at Kilmantin Hill in Wicklow town. The facility, which can accommodate up to 17 people is currently being operated by the Simon Community in on behalf of Wicklow County Council. Kilmantin Hill is a Supported Temporary Accommodation service with the capacity to accommodate up to 17 people for stays of up to six months. Supported Temporary Accommodation refers to the provision of accommodation and activities appropriate for people who are experiencing homelessness. It includes 12 bedrooms, a commercial kitchen, laundry room, dining room, sitting room, small garden, a small room for one-to-one meetings with residents and staff offices. The project was established in January of this year as a 12 month pilot where Wicklow County Council is the owner of the property and the service is operated by the Wicklow Simon Community. Funding for the project is primary sourced by the Simon Community through its donor base in the county with Wicklow County Council providing €150,000 towards the overall running costs. The service at Kilmantin Hill operates on a 24 hour basis and supports people experiencing homelessness from the county of Wicklow by providing secure accommodation and a programme of services for each person. Thirteen people are employed in the service, including professional staff, part and full-time volunteers so that the facility can operate on a 24 hour basis. Speaking at the opening ceremony, the Cathaoirleach of Wicklow County Council, Cllr Christopher Fox welcomed the President to the county and acknowledged the President Higgins’ ongoing support of homeless causes throughout the years. Commenting on the current homeless crisis and how it is impacting on people in Wicklow, the Cathoirleach expressed serious concern regarding “the sharp increase in homelessness across the county, particularly amongst families. What is extremely worrying is that many people currently accessing our emergency accommodation facilities never thought they would be in this position. 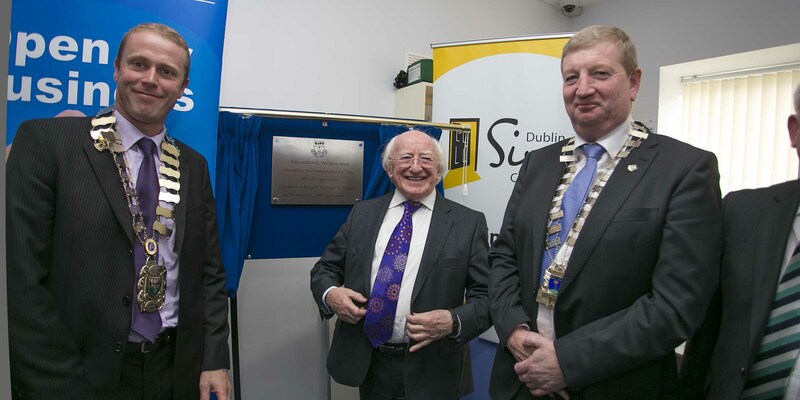 Mr Pat Greene from the Simon Community stated: “We are delighted to welcome President Higgins to the service to meet our staff, residents and volunteers. At a time when the task of tackling, eliminating and preventing homelessness in Wicklow Town, and throughout the whole country, is huge and frightening, this service responds to the critical demand for much needed shelter and support.